In 2014, Alex Caizergues asked us for some custom kites to beat his own speed record of 56.62 kts. The design brief was to reach a maximum speed by riding over-powered with a 6.5m² on the speed run with an average wind of 50kts… We have therefore worked on a kite with more aspect ratio and 5 struts. 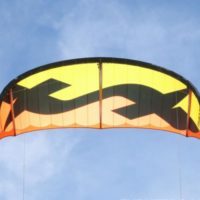 But during the development, two things happened: First we were surprised by the enjoyment we had when riding with this kite. This is due to the thrills it provides thanks to its performance (who doesn’t like speed and acceleration…?) but also thanks to its hang-time. Then the foil riders in search for a long distance weapon became interested in this kite and immediately wanted to use it. The Furtive is F-One’s performance freeride option that features a high aspect sailplan with sweptback wingtips and a solid 5 strut airframe. The front bridle features knots and the two wingtip attachment options feature knot connection points as well. The Furtive did not get the new inflation valve, so the inflation valves are the old style with a narrow inflation valve for pumping up and a dump valve for a quick deflate. 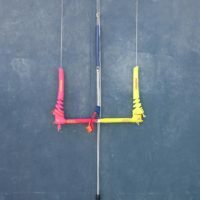 The Furtive is a high-performance kite that builds a tremendous amount of power from apparent wind—it’s not a sheet in and go kite. 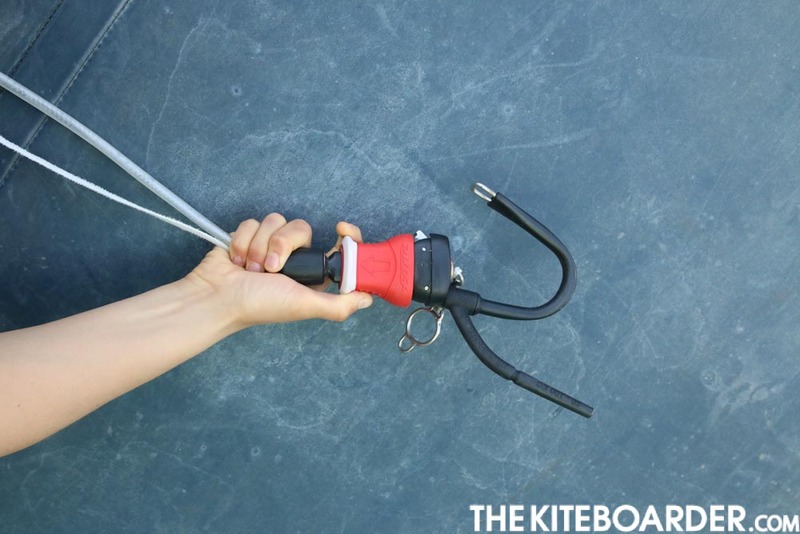 You really notice the kite’s pull as you begin to generate board speed across the wind. The Furtive flies forward in the window and screams upwind no matter what kind of board you happened to be riding. It’s steering is fairly crisp with good response and a much wider steering arc. Compared to the Bandit, the Furtive is not anywhere near as reactive but at the same time it is no slouch. The bar pressure is medium plus, a bit heavier when compared to the Bandit but not burdensome. 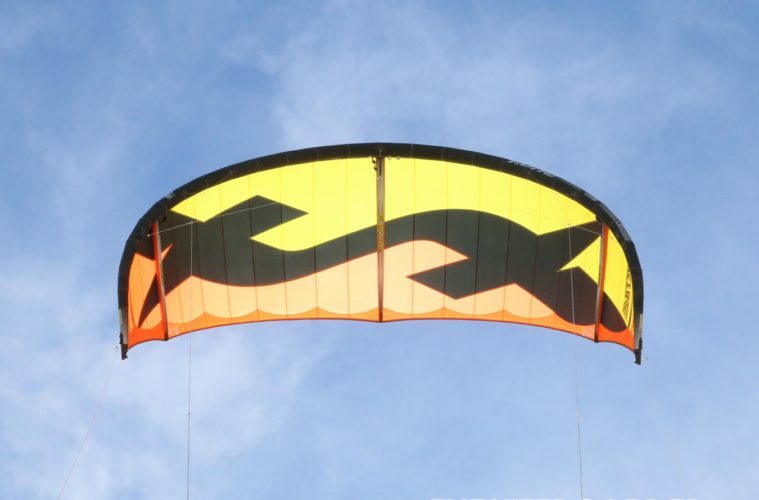 When you load the Furtive up for a big air send, the kite’s higher aspect delivers impressive lift and amazing hangtime. 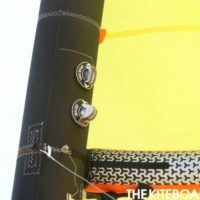 The kite’s steering is still very intuitive and user-friendly so jumping this kite doesn’t present additional challenges. The Furtive pulls and doesn’t have as much depower as the Bandit, nor does it like to fly in the middle of the window as much; it’s happy place is pulling at the edge of the window. Drift is not a word we would associate with this kite, but when it comes to screaming upwind in one direction or boosting big air this inflatable delivers big. The relaunch isn’t quite as simultaneous as the Bandit, but it still reliably relaunched every time, it just takes a little longer to roll over into relaunch position, taxi to the edge of the window and release from the water. 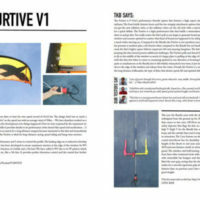 Overall, the Furtive is a niche kite for the speed freak, the big air booster and the long distance foilboarder, the type of kiter that desires speed, lift and upwind ability.The Furtive is F-One’s performance freeride option that features a high aspect sailplan with sweptback wingtips and a solid 5 strut airframe. The front bridle features knots and the two wingtip attachment options feature knot connection points as well. The Furtive did not get the new inflation valve, so the inflation valves are the old style with a narrow inflation valve for pumping up and a dump valve for a quick deflate. 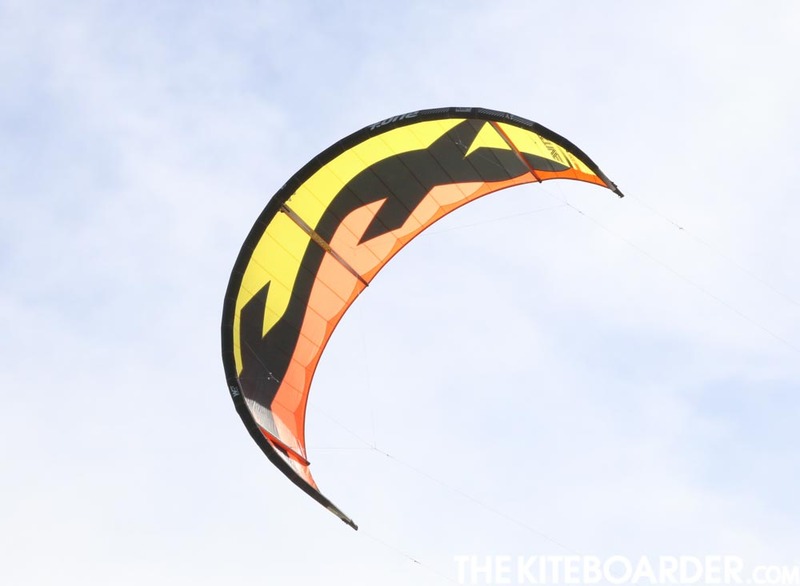 The Furtive is a high-performance kite that builds a tremendous amount of power from apparent wind—it’s not a sheet in and go kite. 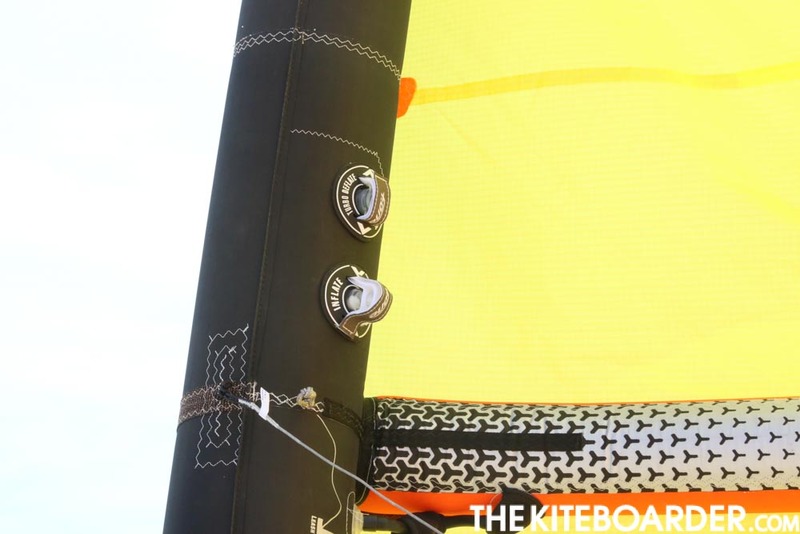 You really notice the kite’s pull as you begin to generate board speed across the wind. The Furtive flies forward in the window and screams upwind no matter what kind of board you happened to be riding. It’s steering is fairly crisp with good response and a much wider steering arc. Compared to the Bandit, the Furtive is not anywhere near as reactive but at the same time it is no slouch. The bar pressure is medium plus, a bit heavier when compared to the Bandit but not burdensome. 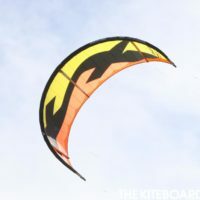 When you load the Furtive up for a big air send, the kite’s higher aspect delivers impressive lift and amazing hangtime. 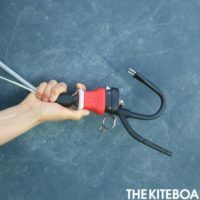 The kite’s steering is still very intuitive and user-friendly so jumping this kite doesn’t present additional challenges. The Furtive pulls and doesn’t have as much depower as the Bandit, nor does it like to fly in the middle of the window as much; it’s happy place is pulling at the edge of the window. Drift is not a word we would associate with this kite, but when it comes to screaming upwind in one direction or boosting big air this inflatable delivers big. The relaunch isn’t quite as simultaneous as the Bandit, but it still reliably relaunched every time, it just takes a little longer to roll over into relaunch position, taxi to the edge of the window and release from the water. 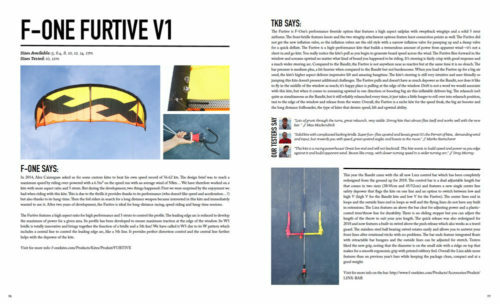 Overall, the Furtive is a niche kite for the speed freak, the big air booster and the long distance foilboarder, the type of kiter that desires speed, lift and upwind ability. This year the Bandit came with the all new Linx control bar which has been completely redesigned from the ground up for 2018. 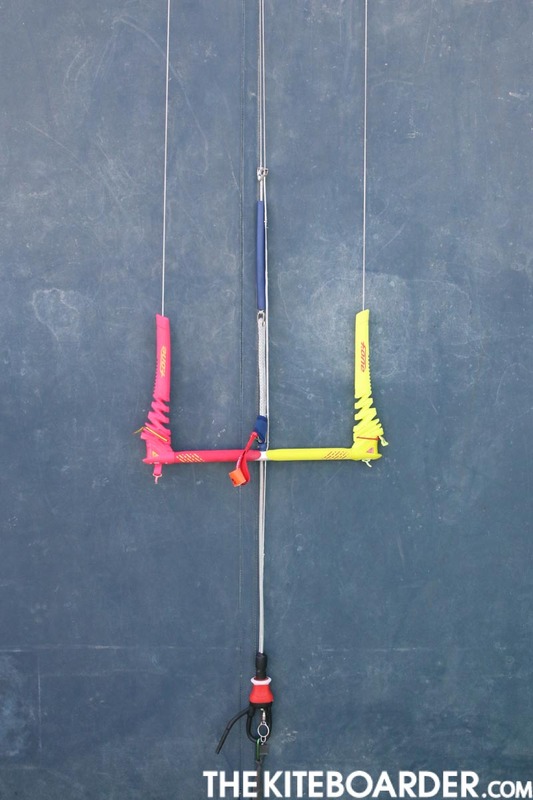 The control bar is a dual adjustable length bar that comes in two sizes (38/45cm and 45/52cm) and features a new single center line safety depower that flags the kite on one line and an option to switch between low and high V (high V for the Bandit kite and low V for the Furtive). The center lines end in loops and the outside lines end in loops as well and the flying lines do not have any built in extensions. The Linx features an above the bar cleat for adjusting power and a plastic-coated trim/throw line for durability. There is no sliding stopper but you can adjust the length of the throw to suit your arm length. The quick release was also redesigned for 2018 and now features a built-in swivel above the push release which also works as a travel guard. The stainless steel ball bearing swivel rotates easily and allows you to untwist your front lines after rotational tricks with no problems. The bar ends feature integrated floats with retractable bar bungees and the outside lines can be adjusted for stretch. Testers liked the new grip, noting that the diameter is on the small side with a ridge on top that makes for a smooth ergonomic grip with printed rubbery feel. Overall the Linx adds some impressive features absent on previous year’s bars while keeping the package clean, compact and at a good weight.